Pretty often I'm thrilled when a Costco product turns out to be even better than imagined. This happened recently with the Fitbit. Costco has these high-tech pedometers for $94.77. I've wanted one for a while, when I saw they were at Costco, I grabbed one. 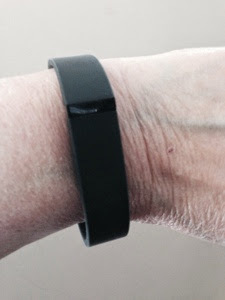 You place the Fitbit on your wrist, and the Fitbit sends the number of steps you walk to your iPhone. You can use the Fitbit app on your phone as a food diary, too. I had an ulterior motive for the Fitbit, I thought it would be perfect for my 94 year old Dad, so I got him one as well. Now, we're Fitbit friends, and, since he's so competitive, he's beating me in number of steps taken! This was pretty easy to set up, but I found the wrist snap difficult to maneuver. My store has now reduced these $10. Happy Birthday, Emilie! Costco Birthday Cakes!